A tasty combination some people just can’t get enough of! 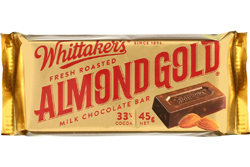 Whittaker’s Almond Gold is a 45g slab of creamy milk chocolate containing 33% cocoa, surrounded by carefully and deliciously roasted almonds. Love it, so glad I can get it here in the UK. Brings NZ to me here.